Forums » General Help and Questions » Is there a way to set min stay only for weekends? Is there a way to set min stay only for weekends? Not currently, but that's a great idea. How would the details work? We've bounced around a couple of ideas here, with the simplest being a weekend min nights rule that kicks in if Friday or Saturday is in the booking. That handles your case because Friday would trigger it, so a guest would have a 4 night min if booking Thu night leaving Mon, Fri night leaving Tue, Sat night leaving Wed. They could still arrive Sun through Wed and get the 3 night min. How do I set that rule up? We have to add it first :-) Does that simple scenario work for what you need? This has now been released. If you go to the property or season Rules section, there is a new Nights During Weekends rule that is triggered if the booking contains a Friday or Saturday night. 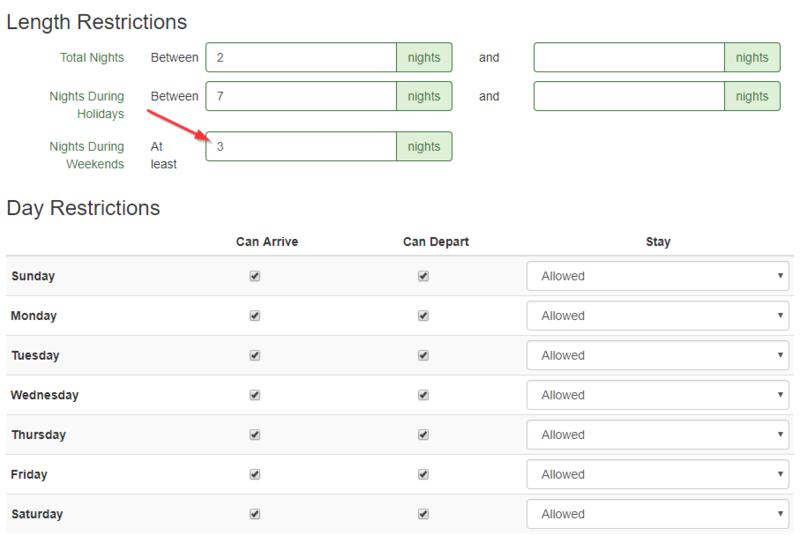 We also overhauled the arrival/departure day restrictions so you can now select multiple days instead of a single.